After a winter of crashing and cleaning, Tim reveals the truth about life off the beaten track. Nearly four months later, this diminutive KTM Freeride 250 R is still making my pulse race like a Ducati Panigale S on slicks. In years to come I will remember it as the bike on which I dropped all my early off-road clangers, the one that politely tolerated my novice incompetence and brought my winters to life. December to March used to be the least active months of my year, but this winter I returned from every icy adventure into the Lincolnshire wilderness with the same buzz I get from a Cadwell trackday in June. Despite riding the Freeride every weekend, I have added barely 450 miles to its dinky odometer. On dirt, mileage counts for less than time: it’s the hours of clutch slipping and clunking headraces off tree stumps that matter. So with 50 hours of running upcoming the Freeride is due a long, hot service. My own DIY jobs have been relatively few. I can’t believe the abuse its chain takes from mother nature’s mud-and-grit based grinding paste so I have a ritual cleaning and lubing session every week. I don’t think I could sleep without doing that. Likewise, the foam air filter needs regular attention and it’s conveniently located in a transparent housing beneath the flip-up seat to make sure it gets it. A wash and oil is a 10-minute feelgood job, so I do that every fortnight. Jetwashing is a mixed blessing for any bike. Without a jetwash I can’t see how it’s possible to properly clean a skin of hardened crud off a dirt bike. But the aftermath of a furious, drive-flooding attack with the Karcher lance is also a bike that feels devoid of lubrication. It leaves the Freeride’s controls and pivots squeaky dry. So I take time to go through all exposed linkages with my new favourite spray-on lube, XCP Professional lubricant. Working on the KTM is good fun, mainly because compared to normal road bikes there’s so little to it – at 92.5kg it couldn’t be easier to manhandle. 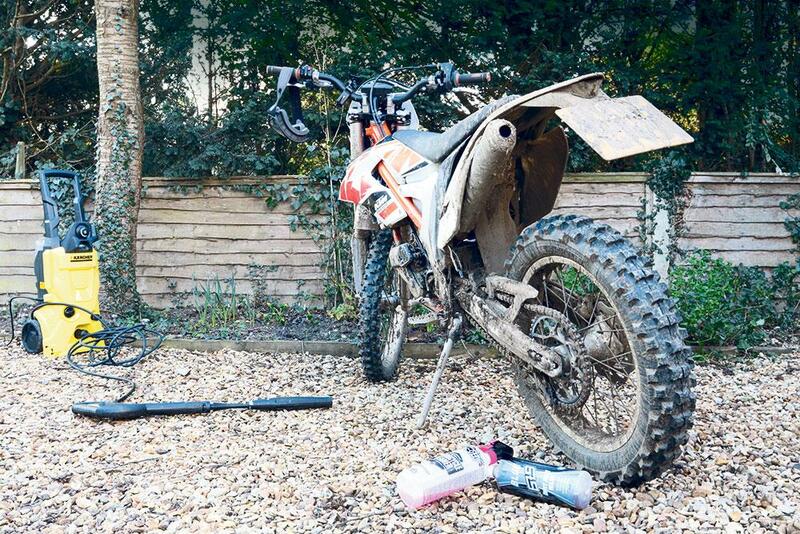 The biggest culture shock for anyone riding off road for the first time is learning to live with a bike that, even after a 45-minute flurry of brushes and microfibre cloths is not, in the normal sense of the word, clean; it’s just not dirty. 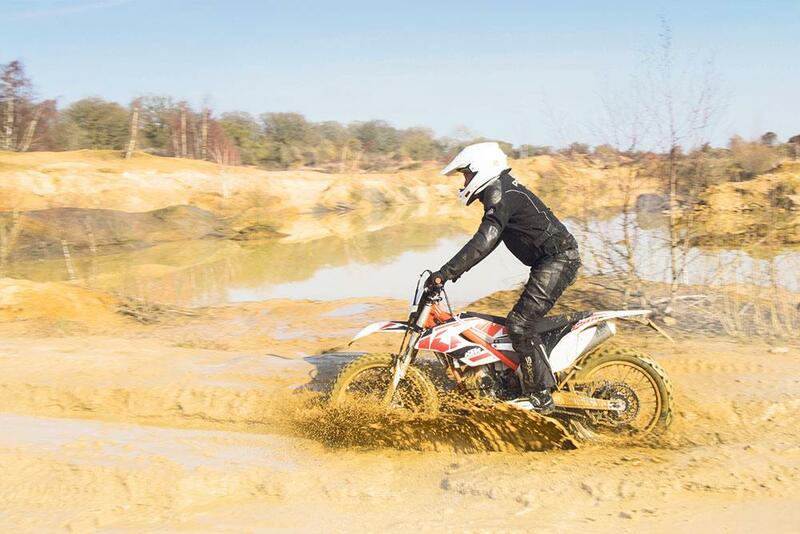 There’s also the realisation that the ownership of a dirt bike entails watching its cosmetic condition deteriorate week in, week out in front of your eyes. I have fallen off, let’s see now, at least 15 times. Each crash has taken its toll, be it in the form of tiny scratches to the plastics or, my worst so far, a rock chip in the frame paintwork. Beyond fuel, premixed with synthetic 2T oil at a clean and lean 80:1, I’ve had zero running costs so far. Even the blocks on the Michelin Enduro Competition tyres KTM fitted to my bike have barely worn. Meanwhile, I have booked myself onto an off-road tour in France in the autumn. My dirt skills need to improve before then, but it’s great to have something to aim for.